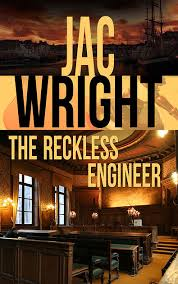 The Reckless Engineer is the first in a series of literary suspense and mystery fiction featuring a courageous and adventurous electrical engineer, Jeremy Aiden Stone. In this first story in the series I look at the troubles that a guy (Jack Connor) can get into whose character fault is that he is weak in love. There are four strong and very different women who pull him in different directions and the story is woven around the intense conflict arising from this situation. At the onset of our tale one of them, Michelle Williams, has turned up dead and Jack has been arrested for the murder. He puts his one call from police custody to Jeremy, now living in London, who brings the top London attorney, Harry Stavers, down to Portsmouth to handle his former best friend’s defence. While Harry handles the criminal defence in a fast developing murder trial, Jeremy blends in with Jack’s family and friends - Jack’s wife and her powerful family, his ex-wife and children from his first marriage, and his colleagues and managers at work – and covertly investigates them to find out who the real killer is, and if his friend is in fact innocent like he claims. What was your inspiration for The Reckless Engineer? I set out to write a series for this one. The first thing I knew was that my series lead was going to be a highly skilled electrical engineer like me. Actually he is more the person I should like to be; he lives the life I want and I live it through him. When I was a child there were several TV series my dad and I loved to watch from our favourite seats in the living room: MacGyver, Mission Impossible, Perry Mason, and Tales of the Unexpected based on Roald Dahl’s adult suspense fiction. At one time I used to read Roald Dahl and Earl Staney Gardner like I was possessed. My series lead, Jeremy Stone, is adventurous, versatile, and resourceful like MacGyver. He is a highly skilled and brilliant engineer like Barney in Mission Impossible. He is courageous and strategically inclined like Jim in Mission Impossible. The second thing I knew was the setting. I wanted to base my story primarily in Portsmouth, the beautiful seaside birth town of Charles Dickens. My mother loves Charles Dickens and she used to read his works to me even before I could read. She had this massive rack of books in the attic on which various classics, including the major works or Dickens were stacked among piles of Reader’s Digests. Portsmouth is beautiful and I wanted to capture its beauty, charm, its industries, hotels, beaches, hospital etc. in the story. What has been your greatest experience since publishing your book? The best experience has been reader feedback to my short story, The Closet, and feedback now beginning to come to me on The Reckless Engineer. There is nothing like hearing from my readers. One of my readers wrote to me after reading The Closet, saying that she is dyslexic and sometimes finds it hard to follow full-length novels; that she loved The Closet and wanted me to continue writing really good short fiction like that. It almost brought tears to my eyes that one of my stories could have helped her. Read the classics as a child. Read and study Drama because it helps in dramatic scene creation. Also read and study poetry because it helps you create strong imagery and appealing prose in your narrative. Do not let what you read on the Internet or other writers’ work drown out your inner voice too much because you end up creating something that is cliché or formulaic. Quiet your mind and listen to your inner voice that will create something unique to you. They were two Agatha Christie books, though I cannot remember which ones. I was in my early teens when my mother started giving me pocket money and I bought 2 Agatha Christie’s books while on holiday. A cruise-ship with a section full of books had come to the port where we were on holiday and my mother took us on a tour around it where I bought the two Agatha Christies. I just finished reading J. K. Rowling’s new mystery, The Cuckoo’s Calling. She creates superb characters though the main protagonist, Cormoran Strike, is a little cliché. She brings her characters to life with very descriptive prose which I like. My favourite is Guy Somé with his filthy mouth and I love that scene with Strike’s encounter with Rochelle, again for the description of Rochelle’s character. I have just started on this year’s Booker Prize winner, The Luminaries, by the Kiwi writer Eleanor Catton. It is described as a gripping literary mystery which sounds right up my street. I loved “A Town Like Alice” set in Australia; so I am really expecting to like this one. I have Buy, Sell, Murder (The Reckless Engineer #2) and The Bank Job (Summerset Tales #2) half written. I hope to publish both in 2014. I have started the fifth, In Plain Sight, with just the plot and the main characters designed and only the first chapter written. I have a hunch that In Plain Sight is going to be my favourite.